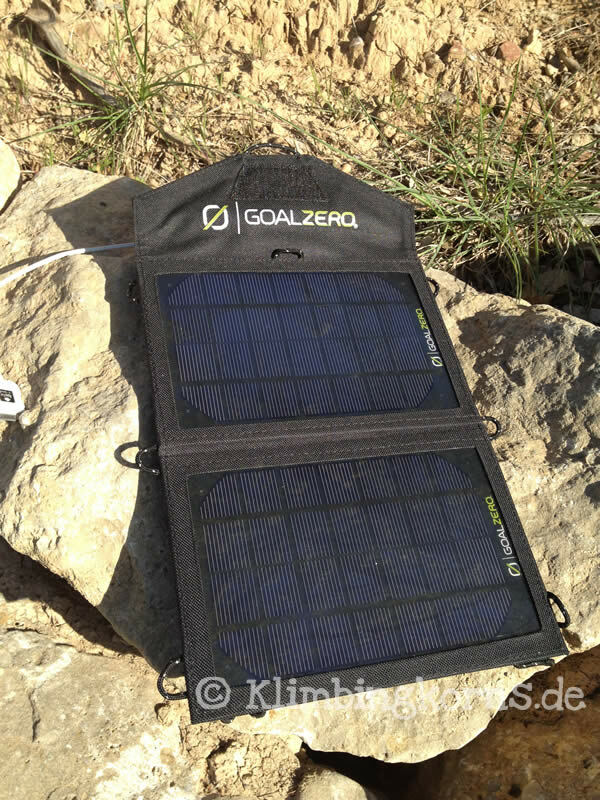 Using a Solar Panel to charge your mobile devices on the go could be your solution if you’re often outdoors. If you keep all your devices with you active and going, chances are that at the end of the day, you are going to be faced with low battery. 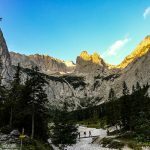 Many outdoor enthusiast are usually happier without any devices at all. But then again, lets just say you’re out on a road trip and your car battery suffers from charging all your iPhones and GPS devices. Yet it would be nice to stay in touch with your family or loved ones now and then. There are 2 possible alternatives in the market. 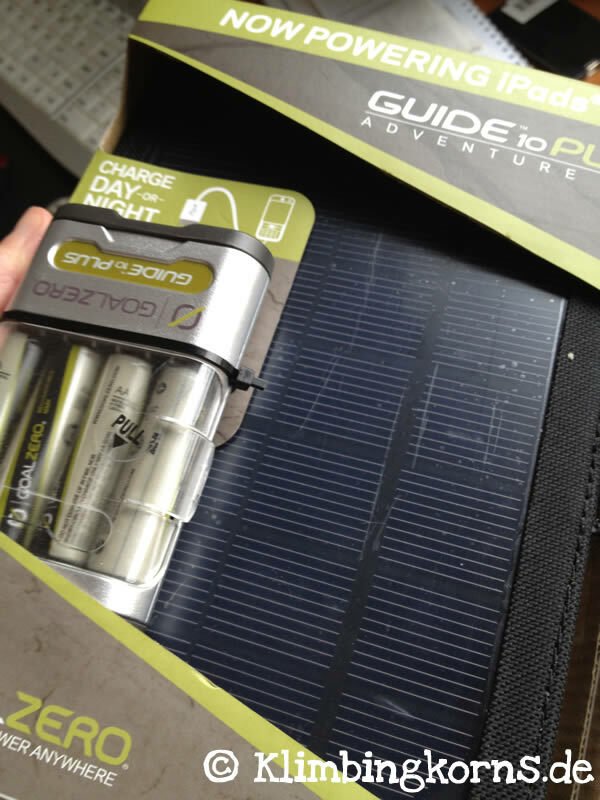 Either get a battery pack or a solar panel. I decided on the latter because this offered me the portable possibility to load all my devices endlessly, as long the sun shines! On the other hand, a battery pack can load devices many times, but it would also mean that after a longer period of time, you will have to look for a reliable source of electricity to load it all up again. 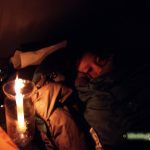 If you’re on the road for a couple of weeks, dealing with high temperatures in the day and freezing temperatures at night, will leave an impact on the storage which means it was just too unreliable for my purposes. 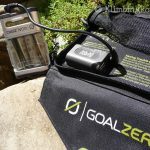 That was why I decided on the Goal Zero’s Nomad 7 Adventure 10 Kit. 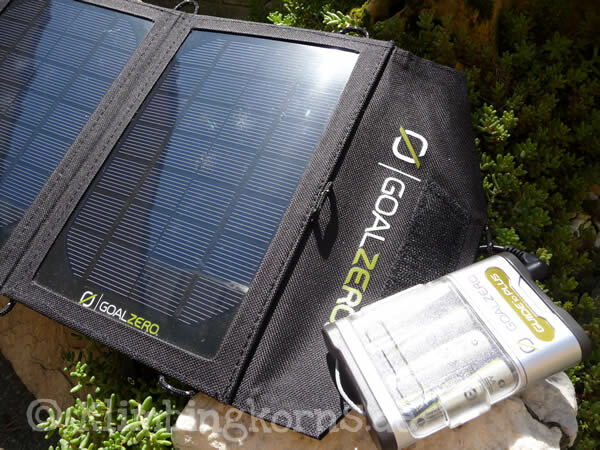 This solar panel comes together with an extra battery pack with 4 rechargeable AAA batteries. There is an adapter for 4 AA size batteries included too. 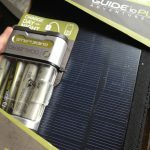 The idea of this combination struck me most that you can use these batteries for your GPS devices and cameras and not use just as a storage for the energy won from the sun. The Nomad 7 solar panel when folded has a size of about an Ipad or a folded A4 paper. The Panel comes with a net pouch to keep all the cables and battery pack in one place during the times you load your devices. When in use, open the Nomad 7 like a book and place it at any sunny place, with the panels opened directly towards the sun. The Panel with all its cables and battery pack weighs about 660 g and is light enough to put it in any back pack. Aha, let me correct that again, you can put it ON any backpack outside and charge while you do your sports. The Nomad 7 comes with 7 small loops on each corner, big enough to fix it on the lashes of a backpack or hang with a carabiner on any tree. When not in use, close the panel like a book and secure it with its velcro fastenings. 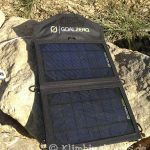 The solar panel comes in a robust canvas cover with a protective plastic front, making it durable to dust, mud or moisture. It is water-resistant not water proof, and I would rather not immerse the panel under complete water or let it out to work during heavy rainfalls. Afterall, your electronic device that is hanging on it is not water-resistant! 3 What happens when it’s cloudy? 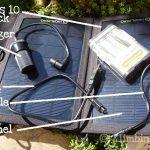 To start charging any device or battery packs, open the solar panel for a few seconds, then plug-in the right cable to your device. You could charge multiple devices at once too – i.e. 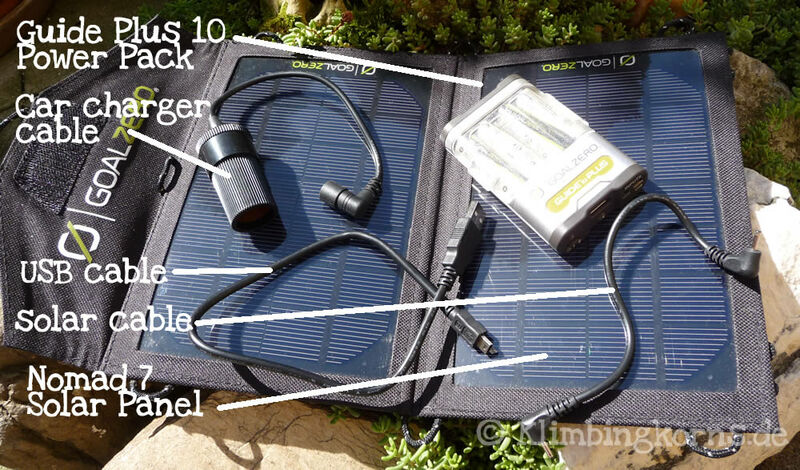 Using the car charger, the USB and the solar panel to the battery pack at one time. This would also mean that these devices would need 3 times longer than usual to load, since the energy is diverted into 3 different sources. If you use just one, depending on your device, this will load in 2-4 hours, by full strong sun with little or no clouds. 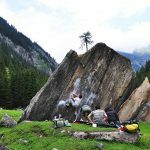 I would usually bring the Nomad 7 along with me to the crags, and leave it at a sunny place to charge till the end of the day. At night, I would then use the charged battery pack to charge up my iPhone. 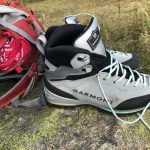 Goal Zero’s concept of the Nomad 7 has been really thought through for outdoor enthusiasts. As its name implies, it is the portable Panel to take along with you during your sport activities during the day, so you can also take measures immediately when you know that you’ll be having 2-3 hours of undisturbed sun. Hang it out to charge! With its protective cover, you must not fear dust or dirt. Not all days are full of sun, not everybody lives in southern Europe or a country that has a strong sun. And usually, it’s also the time where your devices will shout out for more power. During such days, the panel will still charge (I have tried it on days with 100% cloudiness)but it doesn’t yield optimal results. charging any device will take ages. It’s best to plan ahead a little. Make sure your battery pack is fully loaded before bad weather comes. Once the battery pack is full, make sure your smart phone or device is fully charged too. I used the Nomad 7 to charge an Iphone 4s via the USB cable, my TomTom navigation device via the car charger cable. 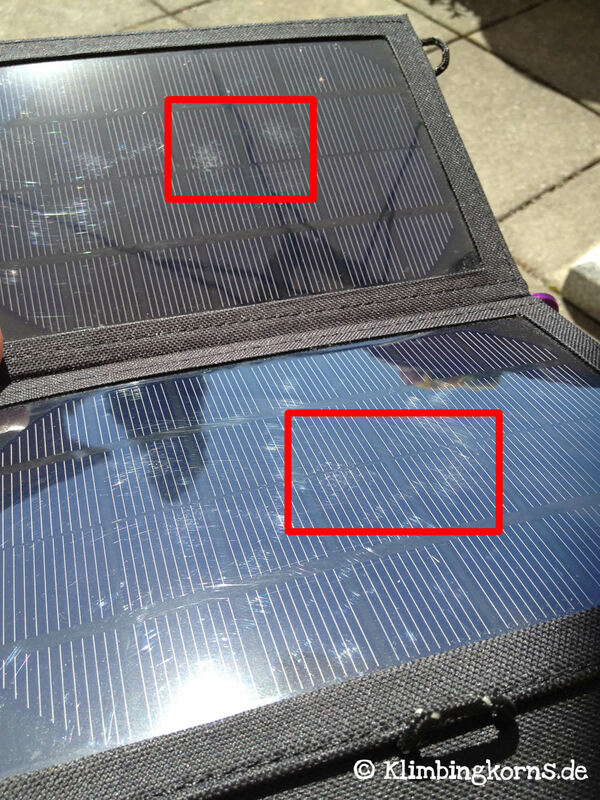 Remember that the solar panel works splendidly while sun is shining. It charges even behind a car screen while you drive, but you will notice that it will not work while you drive through tunnels or while your car parks under a tree shade! My Iphone was on all the time, and it was almost as simple as plug and play with no problems even during disruption. I have read in some cases where disruption causes the Iphone to stop the charging process, so you’ll have to pay special attention in the beginning. If this is your problem, charge your Iphone through the battery pack instead. 1. Best times for charging is while the sun shines with little or without clouds. This means, getting a battery pack, iPhone 4s and TomTom Navi fully charged in 2-3 hours. 2. When clouds appear, charging times can extend to 2-3 times longer. While it rains, tough luck there. There’s just not enough UV rays to supply the panel with energy. 4. The solar panel loads best at an angle of 45° to the sun. Remember that the sun moves during the day, your panel don’t (while you’re not around) so look out for shades that may block the panel to load. 5. Avoid shades or any screens that filter out the sun. 6. Keep your smart phone or GPS devices out of the sun while you’re loading. Best is to keep them behind the pouch, or anywhere else away from the direct sun. 7. 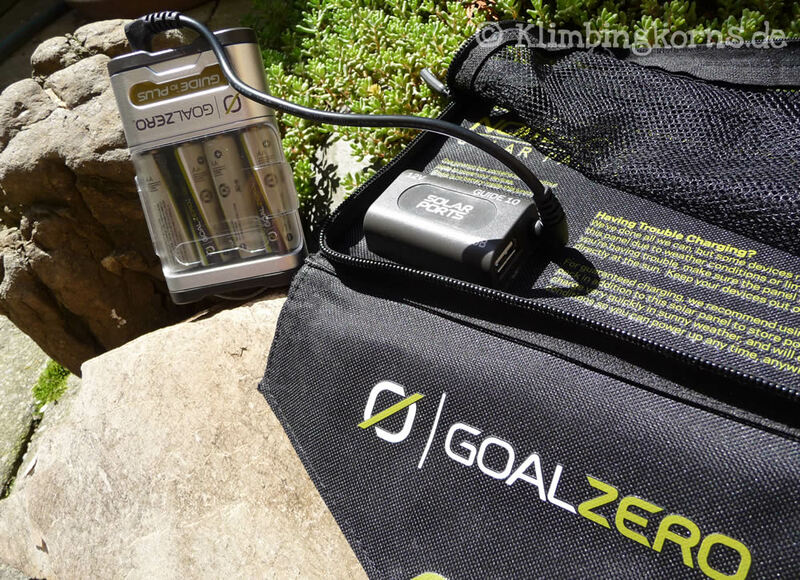 The Battery pack usually has enough energy to charge a device 2-3 times. Nevertheless, take into account that the storage of the battery during colder temperatures affects its durability. In my case, I managed to get 1,5 times out of the pack within 4 days of colder temperatures after a full USB load. 8. Charging out from the car charger cable outputs more energy than the usual USB. If you’re thinking of charging your Ipad or a Netbook, this may work, but it will not bring the full power to charge it fully. 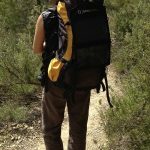 A stronger Kit like the Nomad 13 Panel and Sherpa 50 Power Pack would be a better bet but definitely more expensive. 9. The supplied cables are sufficient for most devices. You will only need to check if your devices come supplied with a USB or a car charger cable. 10. Check the voltage of your smart phone or devices of what input they need in order to be fully charged. There might be problems when dealing with the latest version of the Iphone 5, or Ipads. E.g. My TomTom Navi Device needs an input of 1.2 A, and the car charger cable delivers 1 A. Nevertheless, it charged the device fully by the end of the day. Charges really quick when sun shines without obstruction, which also means you won’t need 6 hours of sun, but a window of about 2-3 hours to get things done. Plug and play. Not much to do but just look for sun, plug it in and charge. 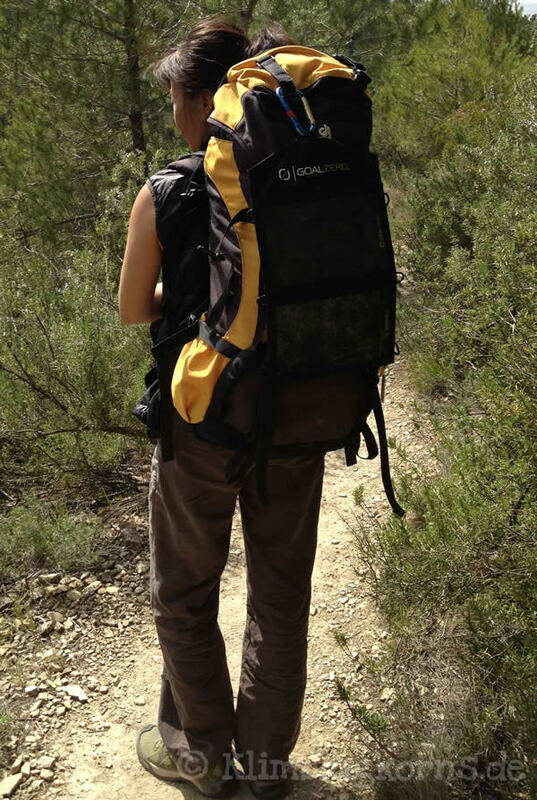 The plastic cover of the panel is vulnerable to scratches, especially while you hike through bushes. Scratches also takes place while the panel is closed. I was surprised to discover this. With pressure applied (when you pack this in your luggage or backpack), the net pouch behind (filled with battery pack and cables) induces pressure on the 2 panels (plastic covers) while they are pressed together and causes friction. 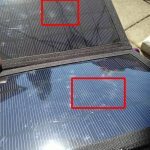 Scratches or any form of harm to the plastic cover will inhibit less UV rays to be absorbed by the panels, which means, the panel will lose its performance, needing more time to load than usual. 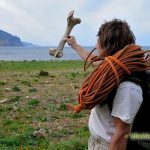 The picture below is an example after 3 weeks of outdoor activity after purchasing. Using a piece of soft cloth or paper, laid between the 2 panels could solve the problem. It would really help if an integrated flap between the panels would protect the plastic cover from scratches during storage. Or, the plastic cover should be interchangeable. Afterall, you don’t buy panels every other year. Bigger Loops. The loops found on each edge are great to hang them anywhere, at anytime. But these loops are a tweek too small for a fat carabiner. It would be great to extend these loops a wee bit by 1-2mm. Charging the Mobile phone Nokia 3410 didn’t work. This is one of the older models of the mobile phones which doesn’t come with any usb cables or functions. I didn’ understand why it charges in the car without problem, but didn’t charge through the solar panel and the 12V car charger cable. An error “will not charge” showed up on the phone every time I plugged it in. It’s great that there are signals that tells you how full your battery pack still is, but it would be awesome when a detail signal in figures shows you exactly what is still left in your battery pack. Helps out to plan ahead, and not get a surprise when rainy days do suddenly appear. Stiff Panel and vulnerable plastic cover. I had to be careful while handling my panel that it isn’t positioned or packed in a manner that it could break. A more flexible, “softer” panel that’s foldable could be my answer. The plastic cover is vulnerable to scratches. Just like your plastic glasses. Once they are there, you can’t just polish them off. Clean your panels often with a soft cloth from dirt and dust before storage. A solar panel is a solar panel. Its a device that absorbs UV rays and turns this into energy. Anyone who expects a miracle to happen when uv rays are minimal, i.e when cloudy, will be disappointed. It still works, but the performance will be reduced to a minimum. When the sun shines, you could literally watch your devices charge in a few hours. 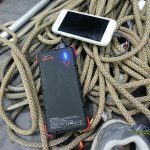 The combination of the battery pack together with the panels is a great combination for the backpacker or outdoor enthusiast who wants to be independant with his devices while on the go. The Kit costs around 120€ and is an affordable price if you are out often. For those of you who needs the laptops or Ipads to be charged as well, the nomad 13 with the sherpa 50 battery pack will be a better solution to keep all your technical devices happy. 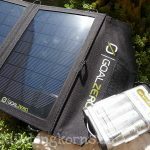 I would wish to see more flexible and portable solutions from Goal Zero like the Sherpa 120 Adventure Kit to keep us outdoor car campers, packrafters and backpackers happy on the go. Thanks for a great review, and the feedback on extending loops for larger carabiners. 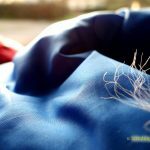 As for the durability, question, don’t worry about the Nomad 7 panel. 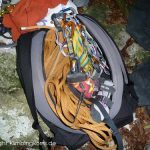 Our gear is meant to be used and abused. No worries from a scratch here and there. In fact, we’ve done a series on the Nomad 7 to show durability. Run it over with a car? Still charges. Dropped from a roof? Still charges. Shot with a 12 gauge shotgun? Still charges. Check it out on Youtube: http://www.youtube.com/watch?v=NLVvPK0RYgw the most interesting tests begin after the 2:00 mark. Of course, what a great website and useful posts, I will add backlink – bookmark this website? Keep doing work ,great job! It’s So much appreciated! Of course, what a good site and educational articlees. Many thanks, to you! What could you suggest about your publish that you made a few days ago? Any positive?